Do you set goals each year? This year I only set a few and I’m pretty determined to keep them. Lose 20 lbs. ~ oh yes…always. And last but most important to me… to be more like Jesus. 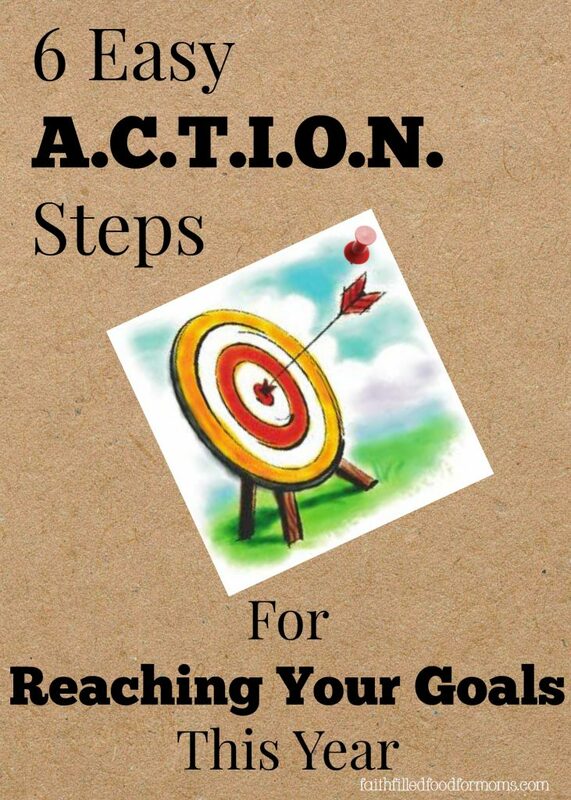 6 EASY A.C.T.I.O.N STEPS FOR REACHING YOUR GOALS THIS YEAR! A ccept where I am today. Don’t beat myself up. No matter what the goal is I need to accept where I am at in the whole process…God Does! C all on God! I don’t know about you but I can’t do anything that is worth anything without God. He must be a part of what I am doing because I tend to make a mess of things on my own. T ake Time: I know that anything worth doing well takes time. Preparing Healthy Foods, Exercising, Writing great Posts, Serving my customers well, Becoming more Christ like. I must make and take time for my goals or I will not reach them. I n-action! Did you know that taking NO action IS actually taking action? It is choosing to do nothing. So don’t not take action! Make sense?! O ptimistic! That’s pretty self-explanatory. Think and Speak greatly about my progress. Don’t dwell on the negative. Keep my cup half full NOT half empty. Don’t compare my progress and life to others. N ow! I am a great procrastinator, so I really have to tell myself “Do It Now!” and then do it! It is also important to have a plan in place so that you do not fail. I hope these 6 easy A.C.T.I.O.N. Steps will help you with reaching your goals this year. What other ideas do YOU have for taking A.C.T.I.O.N.? Don’t wait until the conditions are perfect – if you do, you may not start! I love your acronym – A.C.T.I.O.N – It is very helpful as ALL of the steps resonate with me, especially ‘N’. Praise God, I am slowly overcoming the dreaded spirit of procrastination. Hope you are back to full health, Shari. Hi Carole! Love that.. not waiting for conditions to be perfect!! Good word 🙂 I’m glad that the Acronym was helpful. Yes that old procrastination can keep us so imobalized that we get nothing done. I’m feeling great again and I pray you are having a great start to the New Year also!! Good thoughts here, though sorry you had to be sick in order to take the time to come up with them! Hi Connie! Thank you so much for stopping by! I’m glad you were inspired and Blessings to you in the New Year! I love the ACTION acrostic! Hi Linda, Thanks so much for stopping by! I know myself..if I set too many goals I will definately not keep them all and feel bad..so just a few this year. Glad you liked the ACTION acrostic! The greatest advice I’ve followed about goals is to just begin. There’s something about simply beginning that’s the toughest part. But once I begin, everything else is easy. For example, I usually do power yoga 3-5 days each week. But that’s because I put on my yoga clothes first thing in the morning and don’t take them off (usually) until I’ve worked out. I don’t like getting to the end of the day, when it’s time to go to bed, and realizing I’ve been in my workout clothes all day and never worked out. So I’ve found it to be great encouragement in that area. Blessings in the New Year Fawn! I’m working to lose 15 lbs this year through increased activity and less sugar and salt (minor diet changes). I found this website which has helped me tremendously — well educated means well armed to get it done! http://www.caloriecount.about.com. God bless you this year as you take ACTION! What a wonderful use of acronym to help reach goals! Thanks so much for sharing… And good luck with all of your goals this year! Thank you for sharing on the Art of Home-Making Mondays this week 🙂 Hope your new year is off to a good start! One step at a time. Often people don’t feel that they’ve made progress until they’ve completed or near completed a project. Honestly, it’s just about getting there… the journey and sometimes, it’s by baby steps and just going forward. Thanks for linking up with Turn it Up Tuesday.